Cable assembly connectors are PL75 type plugs. 78 ohm terminator (P/N RT500078 ) is 2 watt, 1% tolerance. Unused stub ports should be terminated with 3000 ohm terminator P/N RT503000 , 2 watt 1% tolerance. Units Under Test (UUTs) are attached to the coupler on each of 5 Stub ports. The 1553 bus is created within the coupler body. Its origin and end points are located at the coupler body ends. The PC with the installed 1553 interface card is typically set-up to be the Bus Controller (BC). It executes a pre-established test to verify successful passage of command words to the UUTs. The UUTs responses are expected back in logical order and timed with the respective status word(s). 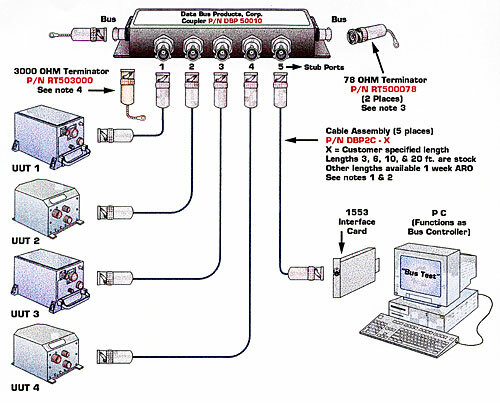 The simple test set-up verifies the connection points at each UUT; the cable; each stub port of the coupler; and its coupling on to the established bus; and the proper bus impedance of 78 ohms.